3. What Is Suspect Screening? 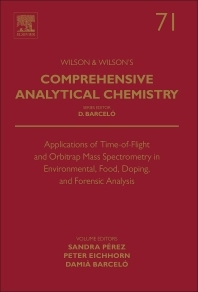 Applications of Time-of-Flight and Orbitrap Mass Spectrometry in Environmental, Food, Doping, and Forensic Analysis deals with the use of high-resolution mass spectrometry (MS) in the analysis of small organic molecules. Over the past few years, time-of-flight (ToF) and Orbitrap MS have both experienced tremendous growth in a great number of analytical sectors and are now well established in many laboratories where high requirements are placed on analytical performance. This book gives a head-to-head comparison of these two technologies that compete directly with each other. As users with hands-on experience in both techniques, the authors provide a balanced description of the strengths and weaknesses of both techniques. In the vast majority of cases, ToF-MS and Orbitrap-MS have been used for qualitative purposes, mainly identification of discrete molecular entities such as drug metabolites or transformation products of environmental contaminants. This paradigm is now changing as quantitative capabilities are increasingly being explored, as are non-target approaches for unbiased broad-scope screening. In view of the continuous innovation of high-resolution MS instrument manufacturers in designing and developing more powerful machines, technological advances in both hardware and software are considerable, with many novel applications. This book summarizes and analyzes these trends. The compilation of selected examples from diverse analytical fields will allow the readers to discover not only the potential of high-resolution MS in their sector, but also shows advances in other fields that rely on hi-res MS.
Dr. Sandra Pérez Solsona, (80 publications and 17 book chapters; H-index=27), Barcelona (Spain). Since May 2005, research associate at the Institute of Environmental Assessment and Water Research IDÆA-CSIC in Barcelona (Spain). She has a Ph.D. in Chemistry from the University of Barcelona (2003). Postdoctoral researcher at the State University of New York at Buffalo (2003-2005). Her work is focused on studying the occurrence, distribution and degradation of pollutants in the aquatic environment. Use of advanced mass spectrometry techniques such as the hybrid techniques UPLC-QToF-MS and UPLC-QExactive-MS, for the structural elucidation of novel transformation products and metabolites of organic pollutants. She uses suspect screening and non-target approaches based on high resolution MS for the detection of polar emerging contaminants and for assessing their elimination and transformation in both natural processes and engineered systems. She has been involved in different EU projects (EMCO, SANDRINE and GLOBAQUA), NSF projects in EEUU and Spanish national projects (CEMAGUA and SCARCE). Principal investigator of CSI-Environment (Marie Curie Actions ITN CSI:Environment PITN-GA-2010-264329). Peter Eichhorn studied chemistry at the University of Braunschweig and received his Ph.D. at the University of Mainz in 2001 for his work on the fate of surfactants in the aquatic environment. He was a postdoctoral research fellow at the IIQAB-CSIC (Barcelona) and at the State University of New York (Buffalo) investigating degradation pathways of organic contaminants in the environment (2001-2005). After a short spell as a researcher at the IIBB-CSIC (Barcelona) with a focus in proteomics, he eventually moved to the pharmaceutical industry (2006) as research scientist in the area of drug metabolism and pharmacokinetics. He currently holds the position of an expert scientist in the ADME group of an international company. Over the years he has considerably built up experience and expertise in the use of mass spectrometric techniques for structural elucidation.